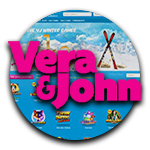 Vera & John Casino is a breath of fresh air in the world of online gambling. The first feature to strike players about this online casino when you first land on the homepage is the colour choice, it’s primarily bright blue and pink. This makes the site stand out from a crowd of mostly red, green and black online casino sites, a great way to be remembered by players especially the female gamblers. Here at Vera & John Casino it really is all about good fun and entertainment, this is a casino for those who love to play but don’t take it too seriously – its about winning but having fun whilst doing so! So what software do Vera & John have on offer? Vera & John Casino host a whole range of software providers that offer you some of the most popular games that can be found in online casinos. You can find 100’s of slots including classic slots, jackpot slots and video slots, roulette games, table games, video poker and scratch cards. So who provides all these exciting games for you to play at Vera & John Casino? As you can see Vera & John Casino offers a wide range of games from various top of the market game providers, so no matter what your preference when it comes to your online casino games you can definitely find it here. The main provider is Net Entertainment as they have games in all the categories offered at this casino. For the rest of the software companies, Vera & John have hand picked the most relevant and popular games for you to enjoy. With Vera & John Casino this is the simplest of processes, of course because their main concern is getting you signed up and having a good time. To sign up you simply click the ‘Join Now’ button in the top right hand corner of the homepage. You are then redirected to a small pop up screen that will only ask you the basics – name, e-mail address and a password. Once this is done you have an account with Vera & John, the next step requires slightly more information and only needs to be filled up if you want to play for real money which of course you do otherwise where would the fun be right? So after filling out the first sign up form, you will receive an e-mail almost immediately (yes they are that clued up with their customer service!) So the next step is to add the additional information so you can get depositing and benefit from some of their unique Vera & John features. All you need to add is your address and the currency with which you want to deposit and withdraw, simple. Now you are read yto deposit and get playing one of the 300 plus casino games waiting for you at this great casino. Another distinctive feature of Vera & John Casino that you really don’t find in any other online casino is the create your own room feature. This lets you create your own personalized room with your favourite games handy for you to play whenever you want without having to look through the site for them. You can choose the background and even a playlist to listen to while you play your chosen games. It all adds up to tonnes of fun at this casino, and a lot of chances for big winnings too of course. How do Vera & John measure up when it comes to customer care and experience? Customer care is of the utmost importance to this casino as it should be with every business. The support is around the clock 24 hours a day 7 days a week, so if there is ever any doubt or query in your mind then you can just get in touch whenever by one of the fast and simple ways of contacting support. The options are simple either live chat, email or telephone. The easiest is always live chat as you can talk to one of the customer support agents in real time and get the most individual attention each player needs and deserves. The overall experience for this online casino is of a great standard, from the look and design to offer of exciting games all coupled together with unique features and superb customer care really makes this one of the best online casinos around at this time. Vera & John is definitely worth taking the 2 minutes to fill in the registration form and getting on board this fun packed journey. As they claim themselves, this really might be the best thing since sliced bread!